Take the family for an overnight stay in Bonifacio Global City and enjoy special inclusions such as: buffet breakfast for two (2) at High Street Cafe and Adventure Zone access for two (2) children below 12 years old and access to Kerry Sports Manila. Golden Circle members staying in a Deluxe Room or Executive Suite have the privilege to upgrade to the next room category, but is subject to availability. Head on also to High Street Cafe for their selection of delectable Easter delights. Come in your most creative costume—from a superhero who saves the world, a beautiful princess who believes in happily ever after, an adorable animal-like creature who explores the jungle, to an astronaut with a space mission—on April 21, 2019 from 10AM to 2PM at the Diamond Ballroom. Tickets are available at Php1,000 nett per person inclusive of a take-home snack box and a load of fun activities. What’s more, kids get a chance to win an Apple Watch Series 4 in the grand raffle draw. It’s a day full of fun, games and surprises for the kiddie characters in costume such as face painting, kid’s salon, and glitter tattoo. Also catch the thrilling live musical performances and magic show amnd wrap up the day with an easterrific picture at their photo booth. Nobu Manila, Forbes Travel Guide Four-Star awardee, highlights its “Easter Break” package, which comes with an option between an overnight accommodation that starts from PHP 13,188 net or a two-night stay that starts from PHP 23, 388 net. The package includes a choice between two (2) Dreamplay “Easter Eggstravaganza” tickets on Easter Sunday, or three (3) Dreamplay tickets and four (4) VR Zone tickets which can be used during the guests’ stay dates. Guests can also enjoy a 25% discount at City of Dreams Manila-operated restaurants and 20% discount on select services at Nobu Spa. Prepare all you princes and princesses as the royal kingdom of Bellevue is putting together a grand day fit for its loyal subjects on April 21, 2019 at the Grand Ballroom! For only Php 1,350 nett per person, kids get to enjoy an all-day filled with festive games, majestic prizes to be won, and a delicious feast fit for a royal. To top it off, four (4) lucky guests will get the chance to win an overnight stay at The Bellevue Manila, B Hotel Alabang, B Hotel Quezon City, and a 3 day, 2 night stay at The Bellevue Resort in Bohol. A special rate of Php 1,150 nett is in store for all Bellevue Kids Club members. 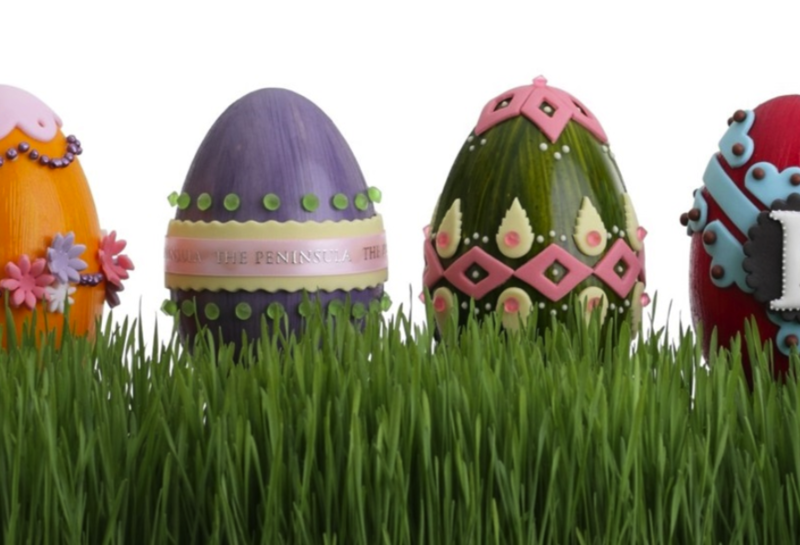 An ideal getaway for the family awaits at The Peninsula Manila's Pen Days of Easter room package. Take a much needed break at one of their well-appointed rooms or suites as well as a range of treats for all members of the family to enjoy. A special Easter-themed welcome amenity will greet esteemed guests while a daily buffet breakfast for two adults and two children below 12 years old at Escolta is also in store. For families staying through Easter Sunday, hop on over to the Rigodon Ballroom and get two complimentary tickets to the hotel's Easter Event. On Easter Sunday, children will be transported to a magical wonderland with a whole host of funfair games and activities such as bounce castle, Velcro wall, egg-painting, and egg-hunt. After all the exciting activities, children can indulge in an afternoon full of snacks, drinks and sweet treats at their candy corner. To avail this, simply book a stylish room starting at PHP7,000, inclusive of breakfast for two (2) and complimentary Internet access, to receive two (2) passes to our Easter fair and egg-hunt activity. Stay dates for are from 12 to 21 April 2019. Take the kids on a fun voyage across the friendly seas with “Set Sail: A Nautical Adventure” at the Marco Polo Ortigas Manila. Starting 9:00AM, go on a special journey with a featured magic show, as well as arts and crafts activities! Tickets are available at Php1,500 per person (kids or adults), inclusive of heavy snacks and a bag full of delightful giveaways. The event is open to the public and will be held at the Grand Ballroom on Level 7. Solaire Resort & Casino welcomes Easter with a celebration that’s another surefire hit. The Ultimate Buffet Series continues with “Happy Hoppy Easter Party” happening on April 2 at The Tent. Surround yourself with vibrant florals and splendid topiary while you and your family enjoy a sumptuous spread for lunch or dinner with refreshing drinks that go perfectly with the blooming season. There will also be an array of activities – from Easter Egg hunt in the venue’s vast grassy field to discovering a culinary knack with the cookie and egg decorating that your kids will enjoy and surely bring out the child in you. For tickets to “Happy Hoppy Easter Party”, you can call TicketWorld at 891-9999.